Once upon a time, there lived a dear little girl who was loved by everyone in the village. The little girl always wore a red color riding hood which was gifted to her by her grandmother. 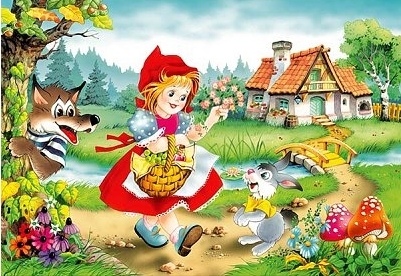 Hence the little girl was fondly called as the Little Red Riding Hood by the village people. One day, her mother gave her a basket containing a piece of cake and wine. She told the little girl, "Your grandmother is very sick. Please take this and give it to her. She will also be very glad to see you". Little Red Riding Hood was very excited about seeing her grandmother. She picked up the basked and started walking to the grandmother's house which was few miles away inside the forest. On the way, a cunning wolf saw the little girl walking inside the forest. He came near and started a conversion. "You look very pretty", said the cunning wolf. She replied, "thank you!". He then asked, "Where are you going inside this forest?" . She was very innocent and thought that cunning wolf was a friendly person. She told him about her sick grandmother and the eatables that she was taking for her. Immediately some bad idea flashed in the wolf's mind. He told her that he has some important work and left that place immediately. The wolf ran quickly to the grandmother's house and knocked the door. The poor old lady asked, "Who is this?". The wolf changed its voice and replied, "I am your grand-daughter - the little Red Riding hood. I have brought you some food." The old lady, thinking it was the little girl, opened the door. Immediately, the wolf jumped on the old lady and ate her. He then wore the old lady's dress and slept in her cot. Meanwhile, not knowing what had happened, the little Red Riding hood reached the grandmother's house and knocked the door. The wolf who was disguised as the grandmother replied, "Please come in little girl. the doors are open"
When the little girl went near the cot, she was surprised to find some strange difference on her grandmother's appearance. She asked, "Dear grandmother, why are you ears so big?" The wolf replied, "I have big ears to listen to your talks"
Then the little girl, "Why are your eyes so big?" "I have these big eyes to see the beauty of my little girl", said the wolf. Then she asked, "Why are you mouth so big and terrible?" The wolf replied, "Ha... Ha... just to eat you up". Saying this the wolf jumped on the little girl to eat her up. The Little Red Riding hood immediately moved away and shouted "Help... Help.."
A young man was cutting down woods near the house. He heard the shout of the little girl. He immediately ran inside the house to see a cunning wolf trying to hit a poor little girl. He quickly threw his axe on the wolf and killed him. Little Red riding hood thanked him for the help.